The two main factors for sustained success in any field of business are: a) identifying future trends, and b) grabbing present opportunities. Blockbuster LLC – once the undisputed leader in the video rental industry – failed spectacularly in both. The company had 9000+ stores across the world, and well over 84000 people on its payroll in 2004 – with hardly any competition in sight. What’s more, it had the chance to acquire Netflix (the company which is most often referred to as the principal cause of Blockbuster’s demise) in 2007, with CEO Reed Hastings practically imploring Blockbuster to take over his company. A mix of complacency, myopic vision and internal board squabbles led to Blockbuster doing nothing at the time. As internet became more and more mainstream, and Netflix started offering online video-streaming options (no more ‘late fees’, no burgeoning costs on physical stores/retail locations) – Blockbuster was unable to cope up, lost customers, and collapsed in a big way. The growth of Netflix ushered in disruptive innovation, and Blockbuster was caught like a deer in headlights. With not enough proactiveness and more than little nudges from unforeseen external factors – Pan American Airlines was forced to shut down operations in 1991. The company had its proverbial time under the sun for 64 years (having been started in 1927) – and at its peak, was easily the biggest player in the commercial aviation sector globally. To be fair, Pan Am was innovative enough (upto a certain point) – having overseen the flight of powerful jumbo jets and computerized reservations. However, the terrorist bombing of Flight 103 (in Scotland) resulted in considerable negative publicity for the company – which had already started to bleed as a result of the early-70s oil crisis, dwindling passenger demands, and serious overcapacity problems. The invasion of Kuwait in 1990 was probably the final death knell in the flight path of Pan Am (as oil prices rose sharply). Once the biggest name in the business, Pan American Airlines simply could not adapt to the changes in its operating environment. One of the classic cases of how years of inaction can kill off a perfectly good business. Founded in September 1888, Kodak went from strength to strength right through the previous century – as the popularity of its cameras and films spiked. Remarkably, the company had the chance to move into digital photography as well – with an employee (Steve Sasson) having created the world’s first digital camera way back in 1975. Instead of jumping on the opportunity, those up top at Kodak totally ignored it – due to their failure to understand that digital photography was the future, and a reluctance to ‘cannibalise’ the sales of their existing lineup of cameras. To further complicate matters, Fuji started to undercut Kodak with its lower-price films – while Polaroid started taking away the market with ‘instant photos’. Kodak tried its bit to stay in the game with the Advantix Preview camera system (>$500 million was spent), but the results were disastrous. Remarkably, the company simply chose to stay in denial for many years – as film cameras grew obsolete, and digital imaging became mainstream. The struggles continued, and Kodak was left with no options other than to file for bankruptcy in 2012. Last year’s Nokia smartphones have done reasonably well – but the company is nowhere near replicating its halcyon days in the late-90s and the early-’00s. At the time, no one made better mobile phone hardware than Nokia – and the Finnish company had almost no competition to be worried about. What’s more, the company had been surprisingly agile right through its history – having moved in and out of several lines of business, identifying telecom as the focal point, and even bringing out the first smartphones in the world (the Symbian Series 60 handsets) in 2002. In fact, the Nokia Communicator was launched as early as 1996. However, the company dithered while deciding whether to join the Windows Phone platform – and more importantly, it continued to believe that hardware was the most important element in a mobile device – while software wasn’t something worth too much thinking. This short-sightedness is precisely what that led Nokia to the brink – with newer players like Apple and Android showcasing the value of mobile applications, and how a handset can do much more that only send/receive calls and text messages. In essence, Nokia was not quite in favour of doing the necessary transition – and was sadly mistaken in its belief of being able to catch up with smartphone vendors later. Microsoft acquired Nokia in September 2013 (a ‘monumental mistake’), and sold the mobile assets in 2016. The belated attempts to use the Android platform cannot mask over the heavy price that Nokia had to pay for not innovating – properly and in time. For a company that survived the big dot com bust in 2000 and had ~10X increase in sales in the 2001-2008 period, the fall was – let’s just say – unforeseen. The tale of Yahoo! Is one of a series of missed opportunities, and a futile determination to stick to being a web portal – at a time when its principal rivals were turning to search, or becoming social media giants (or, for that matter, better news aggregators). Unbelievable as it might seem now, Yahoo! messed up chances to acquire Google (Terry Semel, the CEO at the time refused to agree with the $3 billion price) in 2002, and Facebook (the deal would have gone through if the offer had been even $0.1 billion higher) – while a great takeover offer from Microsoft was also scorned at (the bid of $44.6 billion was deemed as too low). The inputs from a string of CEOs ill-equipped to save the sinking ship did not help matters – and Marissa Mayer’s ill-advised (and outrageously overvalued) acquisition of Tumblr was yet another gross mistake. At one point of time, Yahoo! released 24 different company descriptions in 24 years – clearly indicating a lack of focus. A failure to make it big as a search engine (a deal was struck with Bing in 2009), poor performance as a social media site, and the general drop in popularity of web portals ensured that Yahoo! had little chances of a comeback. If you do not innovate, you die. 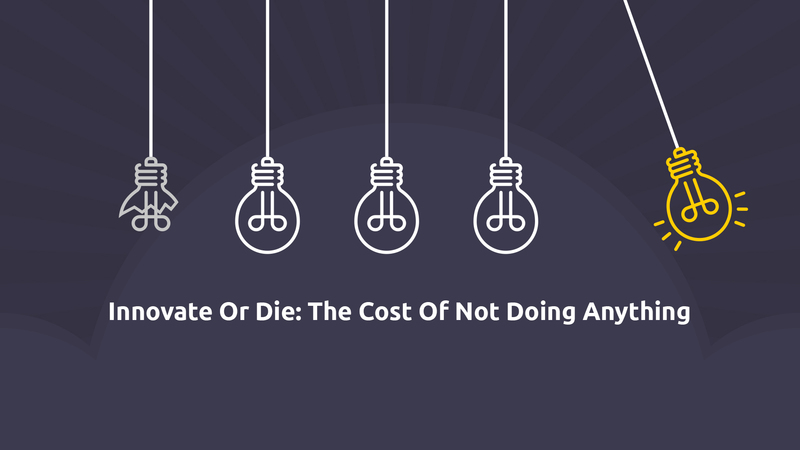 If you do innovate but then take no tangible action on your innovations, you die too. Xerox – the once-immensely popular print and document processing service provider – is one of the best examples of the latter. Its ‘914 photocopier’ was a roaring success, there were no dearth of resources, and ‘scientific excellence’ was something that the company became renowned for. Established in 1970, Xerox’s Palo Alto Research Center (PARC) threw up a series of top-notch innovations – right from graphical user interfaces and laser printing, to PC prototypes, LANs and mouse – over the next three decades. Sadly though, Xerox never grasped the fact that it could move out of the ‘office photocopier’ business, and become a name to reckon with in the overall computing industry. The company just sat on its valuable innovations, and gave them away to competitors (Microsoft, HP and Apple were some of the companies that benefited from Xerox’s technologies). In 2000, the share price of Xerox had dropped to below $4 – and many short-term debts and other problems had piled up. Another tragic tale of lost opportunities. The rise and fall of Blackberry (Research-in-Motion) has a lot in common with that of Nokia. Once considered the ‘ultimate smartphone’, Blackberry simply got too comfortable with its heady success – and failed to look out for the technological disruptions heading towards the mobile platform. Company co-founder Michael Lazaridis once famously said ‘I don’t get this’, while pointing at an all-touchscreen handset – a quote indicative of the tunnel vision that the company suffered from. Indeed, the management could never think of a smartphone as anything more than a mobile phone with a QWERTY keypad, decent network connectivity, options for push email (a USP of Blackberry phones) and robust security features. The world had, however, moved on – and by the later years of last decade, both Apple and Google had started to churn out handsets that qualified as ‘all-round smart devices’. The biggest point of difference was the third-party app support – with the Blackberry App World remaining a pathetic distant cousin of the App Store and the Play Store. Odd product choices damaged the situation further – with the weird Blackberry Passport having few takers. The first Blackberry touch-based smartphone (running on Blackberry 10) came out six years after the launch of the first-generation iPhone. Blackberry Messenger (BBM) was, on the other hand, replaced by WhatsApp by most users. Innovation and implementation have to be fast – and Blackberry missed out in a big way. From being the undisputed market leader, the brand is presently flirting with irrelevancy (0.0482% market share last year). A mixture of innovation shortcomings and unethical financial practices spelt doom for Enron (founded in 1985) – which had once been listed as one of the top 6 energy companies in the world. By 2000, Enron was in the list of top Fortune 500 companies (peaking at number 7) – and was widely viewed as the most ‘innovative’ company in the United States. Soon after though, things started to go pear-shaped for the company – firstly with the broadband telecom networks that caused big losses, and then with the rapidly falling market capitalization figures following the recession at the turn of the century. Instead of coming up with solid plans to tide over the problems and make a smooth transition, all that Enron did at the time was hide/overstate its actual earnings – all under the watch of the then-CEO Jeffrey Skilling. It later came to light that the company had been inflating its income since 1997 (by close to $600 million). From a high of $90.56 in 2000, Enron’s share price tumbled to $0.26 in December 2001. The company had the base and the resources to tackle the problems and stay innovative – but chose to go with underhand practices. The infamous ‘Enron Scandal’ was the final nail in the company’s coffin. The United States Postal Service presents yet another case of ‘business inertia’. It has been in existence since 1775 – and has witnessed huge volumes of posts and document transfers in the previous century. Over the years, USPS has been innovative enough – taking the American postal system to higher efficiency and convenience. However, it has not been able to keep up with the current age of digital, paperless communications and smarter service providers – as rivals like UPS and DHL have have grown and consolidated their positions. USPS, meanwhile, have hardly done anything to retain its competitiveness – and the unfavourable government regulations have not helped either. Postal services as a whole are falling behind – USPS, with its outdated services, are, expectedly, suffering. Faxes, emails, text messages have all combined to bring down the dependence of people on snail mails drastically. Bookstores are good. And there was a time, when there were none better than the Borders Group – which started out from Ann Arbor (Michigan) in 1971. Throughout the US, there were superstores – and the company went for international expansion, with stores in Canada, Singapore, Australia, New Zealand and the United States. Sometime in the 90s though, the popularity of the Borders bookstores started falling – and ironically, the ‘size advantage’ that it had was what that turned against them. In other words, the huge bookstores – established on prime real estate locations at hefty charges – were no longer viable, simply because there were not enough sales. The need of the hour was prompt innovation – which, in this case, meant moving on to online sales of books (just like principal rival Barnes & Noble did). Borders did not consider the fact that the ‘traditional way of buying books’ was fast going out of fashion – and curiously, invested more on expanding their physical stores. No heed was paid to the opportunity of creating an ebook reader like Nook or Kindle either. The idea of moving to CD/DVD sales just as the world was warming up to digital music did not make much sense – while outsourcing book-selling rights to Amazon did not benefit the company. The widespread economic recession in 2008-09 was a big blow, and a couple of years later, the company was liquidated (with almost 11000 employees laid off). While the margins for error in the private sector are also decreasing, entrepreneurs still feel that they can take the occasional risks to take their companies forward. In the public sector though, a single mistake can lead to huge losses and probable firing. Staying ‘safe’, and well away from (potentially rewarding) risks is viewed as the better option. The greater the bureaucracy in a government, the more is the chance of senior-level decision-makers being detached of the actual situations at the grassroot levels. As such, they can greenlight innovative drives that might have worked well in an ‘ideal’ economy – but fall flat due to the many existing bottlenecks. Unless the person/group of people have updated, real-world knowledge, innovations – however well-intentioned – will fail. Another flourishing company that was brought to its knees by the typical ‘big company syndrome’. From Elton John to Colin Hanks (who made the ‘All Things Must Pass’ documentary as a tribute to Tower Records) – celebrities and general public alike were big fans of these physical music stores. The collections and variety were impressive – and music could also be ordered through the stores. Founded by Russ Solomon, Tower breezed through the 80s and the 90s with high sales and very impressive revenues. However, no one from the company realized in time that Tower Records was becoming too big for its own good – with its aggressive expansion plans. As internet grew and digital music became the go-to option for more and more people, the large retail stores grew non-viable. In addition, the competition with big players like Walmart and Best Buy (who started giving out hefty discounts on music records) hastened the end for Tower Records. A combination of digital platforms like iTunes and Napster, along with indiscriminate expansions, killed off what was – at one time – a market leader in the music industry. Tower Records filed for bankruptcy in 2004 and 2006. From being top of the class to going bankrupt (in 2009) – the 101-year old journey of General Motors (‘old GM’) makes for an interesting read. By 1954, the company had a whopping 54% share in vehicle market of North America (in 2009, that figure had dropped to <20%). The need to innovate and improve was completely bypassed by GM – with the changing customer needs & preferences, and the latest automotive technologies being reduced to footnotes. Over time, the vehicles that GM turned out came to be viewed as outdated and uncompetitive (the time to make them was also inordinately high). Upstart competitors started to eat away at the market – and the financial policies taken by the company (particularly since 2006) were mostly poor. Moreover, the infrastructure involved huge amounts of fixed costs (unlike many of its rivals) – and as demands slackened, the company still had to bear heavy expenses. The acquisition of Fiat was poorly handled. However, the standout ‘failure to innovate’ factor for GM would be the killing of the EV1 electric car. There is a lot of buzz over autonomous cars at present – and GM could have had a huge headstart if it had persisted with the EV1.